Give a one of a kind favor to your one of a kind crowd with these Personalized Expressions Collection Key Chains from Fashioncraft. Whatever the occasion - a wedding, Sweet Sixteen, shower, anniversary or any other special event - these favors make it all your own! 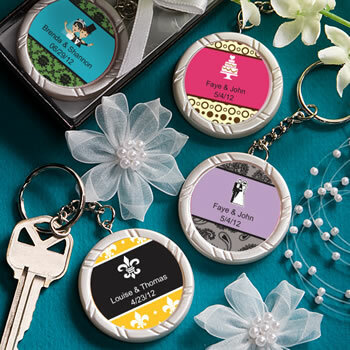 Each measures 5" x 1 .5"" and has a silver metal chain and ring attached to a round white poly resin charm with a grooved pattern rim and an inset center fit for easy application of the personalized peel and stick label of your choice. From assorted color combinations, to seasonal and themed designs, to your own title, you design the eye catching label that suits your style! Each comes packaged in a clear topped box with a black base and silver insert, finished with an attached white satin bow. Does not come with key. Please allow 3-4 days for production. I originally ordered thinking the keychains were coming already engraved or with a permanent custom insert however the keychains come blank and with sticker sheets for you to assemble yourself which was kind of disappointing. The killer part is they come prepackaged and inside of box already, so you have to unwrap and in box, apply all the sticker decals to each keychain and then re box and re wrap. Can be a bit much when ordering a lot of keychains. Also think maybe the decals should be printed on a better quality paper or even a weather resistant sheet as they are keychains and will probably get wet in the rain and snow leaving you with either runny ink or tore up decal after it gets exposed to moisture. Can't really make that much of a fuss for the price though I guess you get what you pay for. The key chains arrived on time and the quality and print can out nice. I highly recommend the key chains as favors. I wanted to order key chains for my niece's sweet 16 party. Online it looked like I needed to pay for faster shipping as the keychains are personalized and I did not have a lot of time. I called and placed the order with regular shipping as instructed. The keychains were perfect and were delivered a day ahead of schedule. They were really nice given the price point. I will definitely use Nice Price Favors again!! Thank you. The key chains was the perfect favor for one of my wedding favor gifts. They were just what I was looking for, and at the right price. I love the fact that each key chain came in its own little gift box, however I didn't like that I had to put the sticker on each key chain. That was kinda time consuming but over all they will be a great gift to give and I can't wait to pass them out at my wedding this fall. Due to last minute planning with timing to receive the key rings, I was quite satisfied with the creativity of the label and the cost of the items. I only wish the fonts were a little larger on the label. All in all it was a great quick find for favors and I will visit the site again for my next occasion.